A special press conference over the problem with the stray dogs will be hold Monday in Bulgaria's capital city of Sofia. Officials are to present a new program for preventing rabies spreading among the homeless animals, which will be launched in 2009. The General Manager of Bulgaria's National Veterinary Service (NVS), Zheko Baychev, his Deputy Damyan Iliev as well as the Director of Animal Health Care Directorate, Pencho Kamenov will be among the participants in the discussion. NVS has recently said there is danger of rabies in Sofia, as there were registered cases of wild animals infected with the disease attacking dogs in the suburbs of the city. On August 1, an infected wild fox attacked a home dog in the district of Vladaya, Dr. Iliev, reported and added that all animals in the district are now under quarantine. All animals on the territory of Vladaya have already been vaccinated, Iliev said. 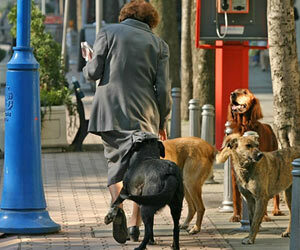 He advised dog owners to keep their animals on a leash and citizens to stay away of stray dogs. Meanwhile, the director of Sofia's municipal company, Ecoravnovesie, which is responsible for the city's stray dogs, said that the warning seems like provocation and there is absolutely no danger of rabies spreading in Sofia. Mr Miroslav Naydenov pointed out that there is no single case of a stray dog infected with rabies in Vladaya. From the NVS said that 40 cases of rabies are registered annually in Bulgaria and almost half of them are on the territory of Sofia and the region around.